Service-oriented architecture (SOA) is one of the most important topics on the agenda of any IT person. 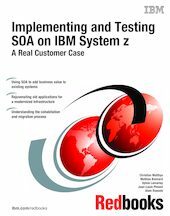 SOA involves a new vision of how to design, develop, and manage applications. It also has new requirements when building an architecture for the underlying infrastructure. This IBM Redbooks publication is the result of a project managed in the IBM European Design Center, based in Montpellier, France. The scope of the project involved helping a major worldwide customer in the automotive industry to validate and justify an SOA implementation. In particular, the customer wanted to add new business values to work with its partners, by adding new data models. It also wanted to modernize an infrastructure, by adding new Internet interfaces. The customer faced the need to eradicate an obsolete programming language. Furthermore, it wanted to build a smooth migration path, with as few risks and costs as possible. The thought, planning, and architecture of the new system, which included integration of the SOA concepts, was built by the customer with the participation of Atos Origin, a leading international IT services provider. The existing customer IT infrastructure was already built around UNIX systems, IBM System z, non-IBM clusters, SAP solutions, 3270 screens, IMS-DL/I databases, and specific code. SOA was the right solution to connect this existing environment to new components using Java, Web services, and DB2 in particular. This book explores the business needs and the architectural choices that were faced by the customer. It describes the mock-ups and prototypes, provides performance numbers that were used to validate the decisions, and explains how they were implemented. It also suggests a generic and riskless solution to eradicate the obsolete programming language.